The 52-year-old Afghan man left-wing activist Elin Ersson temporarily delayed from being deported was convicted of “abuse” and sentenced to jail before being ordered to leave the country, according to reports from Swedish media. According to Helsingin Sanomat, [the 52-year-old Afghan man] has received a prison sentence in Sweden for abuse. The newspaper also writes that his asylum application was rejected and that he should be expelled to Afghanistan. He will still be expelled, but when is unclear. – “I had no information about him before and did not find out later. It was him as human I tried to help, and did not focus on what he had previously done in his life. It was my personal decision,” says Elin Ersson to Dagens Nyheter, who also writes that he has been sentenced to imprisonment. 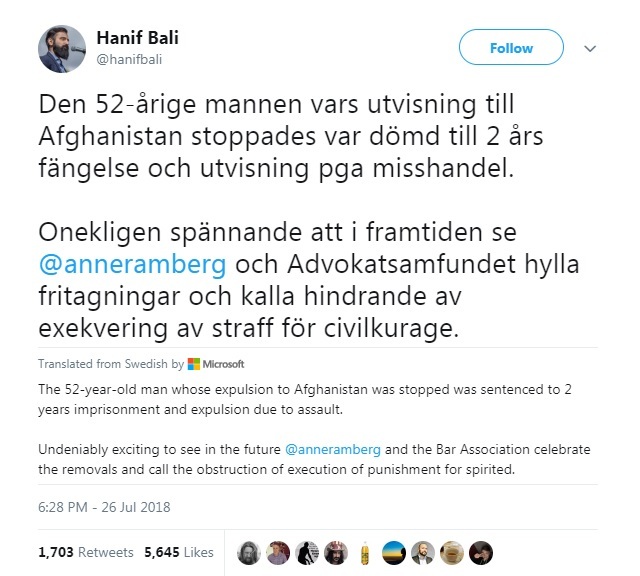 Hanif Bali claims on Twitter that the man has been sentenced to two years in prison and expulsion because of criminal assault. Free Times called the police, confirming that the man is convicted of abuse. However, he should not have been expelled because of ill-treatment, according to the police. – “He was convicted of abuse. He has served a penalty. I do not know if it was gross. The sentence was deserved and he would appear, but he was not sentenced to crime,” said Ewa-Gun Westford, presidential spokesman at Police South, free time, but can not say how long punishment he received. For the police, the investigation has long been completed and handed over to prosecutors as prosecuted. It is the Migration Board that has taken a decision on expulsion, and then hands the case to the police authority for handrail. According to the police, secrecy is extra strict for persons to be expelled. Some information about which district court the man is sentenced to, which goal number the sentence has or what the man’s name is, we do not get. I corrected some of the syntax and I added links to the sources for verification. English doesn’t appear to be the author’s first language, but the report appears accurate. For all she knew, she was stopping the deportation of a convicted terrorist. Clearly, her main interest was social media fame — and boy oh boy did the media reward her with it!